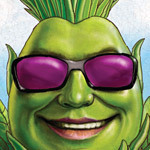 See How Taking Care Of Your Plants' Roots Wins You Optimum Harvests! Will Voodoo Juice Make My Roots Too Big? You’ll see maximum root growth when you use Voodoo Juice, allowing you to make more efficient use of the root zone so you get maximum harvests. If I Use Voodoo Juice, Why Would I Use Your Tarantula Beneficial Microbes And Your Piranha Beneficial Fungi Formulas Too? Each of these three products contains unique beneficial microbes that contribute to the nutrient healthiest root zone so your plants grow their best. The microbes in these three products combine to form a symbiosis with your roots and each other to provide even more root enhancement. Will Your Previous Version Of Voodoo Juice Work With Your New Version? Yes, our previous Voodoo Juice works well in all types of gardens and systems, and is compatible with our stronger new & improved version of Voodoo Juice. Always store our beneficial microbes formulas in a cool, dark place to extend shelf life. 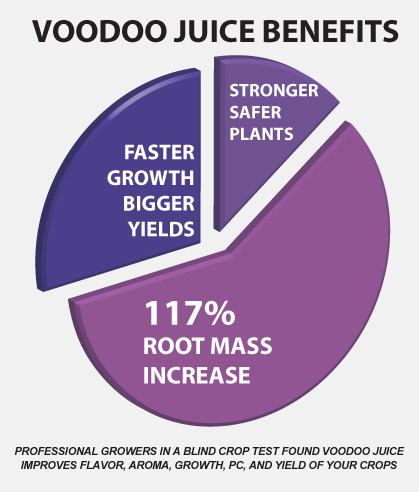 Is Voodoo Juice Compatible With An All-organic Fertilizer Program? Yes, Voodoo Juice, Tarantula and Piranha are organic supplements that work well in all-organic gardening as well as all other types of gardening. Voodoo Juice Increased The Size Of My Roots And My Flowers! It Doubled The Size Of My Plants! Their Roots Were Better Than Any Plant I’ve Ever Grown… I’m Sold! The Roots Must Have Been 3 Feet Long – The Plant Was One Huge Bud! Jorge, from Pima County, Arizona. ATTENTION: Voodoo Juice is completely compatible with all pH Perfect® and non pH Perfect® Base Nutrients along with all competitors Base Nutrients and Supplements.